There are 3 main components which go into making a great shot – Grip, Trigger Pull and Sight Alignment. Obtaining all 3 correctly at the same time is perhaps as elusive as the perfect golf swing, but that won’t stop us from trying, now will it? In this article we concentrate on how to obtain a correct grip and what advantages this can provide. Where do my hands go? What should they be holding and how tight? How do I get the same grip every time? What the heck do I do with this extra thumb? If holding it sideways works in the movies why can’t it work for me? By the end of this you should have a better idea of how to answer these questions and apply these skills next time you are slinging lead down range. 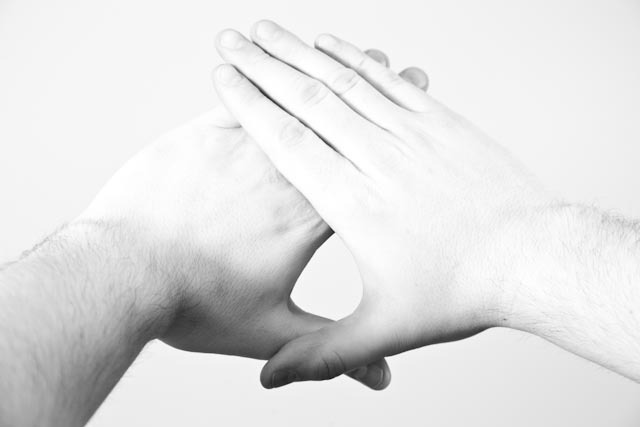 Weak Hand or Off Hand – See ‘strong hand’ above, then look at your other hand. 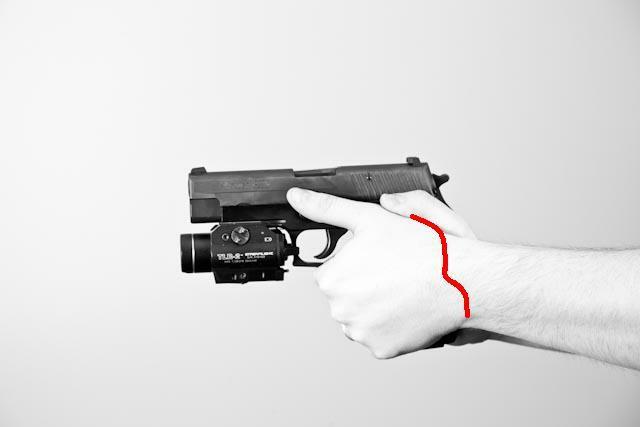 This is the hand which will not be touching the trigger. Surprisingly, this hand is extremely important to your total grip effectiveness and recoil management. 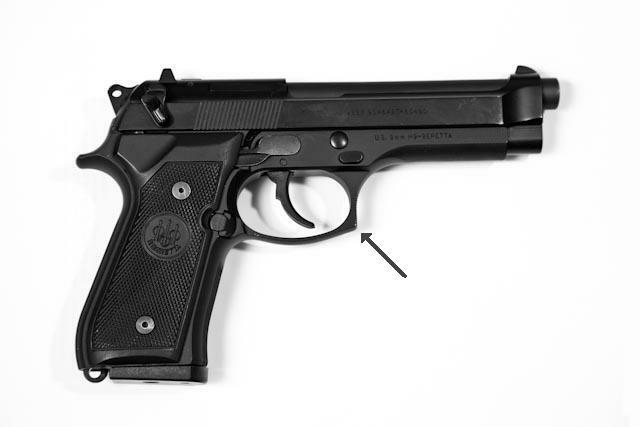 Trigger Guard – This is the strap which protects the trigger from accidental contact (Fig 1). As you will see below, the trigger guard is a good reference when placing your hands. Always keeping in mind where your hands are in relation to the trigger guard will help to orient you the same way each time. 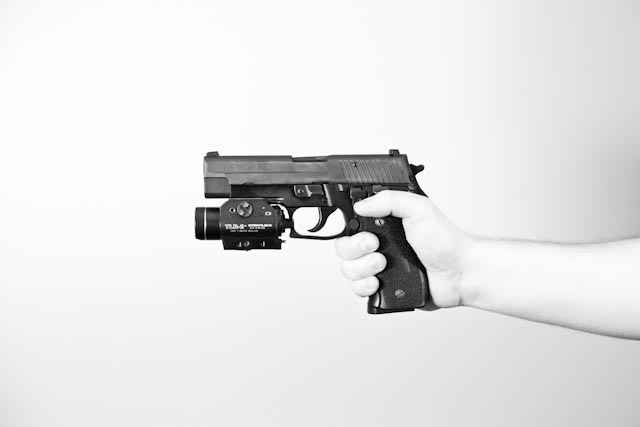 Recoil – This is the reactant force of the pistol from the shot. Isaac Newton’s Third Law is “for every action in nature there is an equal and opposite reaction”. Basically, this indicates that the force provided to accelerate the 115gr. 9mm bullet out of your Glock 17 at an average velocity of 1230 ft/s has an equal and opposite force exerted on the pistol itself, which ultimately travels into your hand. Fortunately the pistol weighs significantly more than the bullet, so the acceleration imparted is easy enough to handle. As we improve and wish to shoot faster consecutive shots, reducing recoil displacement of our ‘Point of Aim’ will become increasingly more important. Eye Dominance – Very few people who have not fired a scoped rifle or utilized some form of magnified optics will know which of their eyes is more ‘dominant’. Just as people are right or left ‘handed’ you will have an eye which your brain has decided is significantly cooler than the other. There are a myriad of reasons for this: plain human physiology, poor sight in one eye, injury to the head or incurable crazy-brain syndrome (don’t worry, I just made that one up). Statistically, people who are right handed tend to be right eye dominant and vice versa. Some ‘lucky’ people (oddly enough many of the people I end up having to teach) are cross eye dominant. This means you wish to hold your firearm in your right hand, but line up the sights with your left eye. This can be very difficult to deal with while using a rifle with high powered optics, but is generally manageable with a pistol. If you happen to be amongst this lucky crowd you may wish to consider learning to shoot ‘off handed’, especially if you are going to be using rifles as well. This will allow you to train one trigger finger rather than two. To figure out which is your dominant eye, extended your arms and make a small triangular hole with your hands (Fig 2). Pick a small point on the wall in the distance (a light switch perhaps) and look at the object through your outstretched triangle. Close your right eye, then open it and close your left eye. Whichever eye you see the object with is your dominant eye. As far as your brain is concerned your other eye just provides a ‘second opinion’ on what’s happening in the world. Alright, that should cover most of it, lets learn how to hold the darn thing! While holding the pistol, the strong hand is trying to accomplish 4 things: Hold the pistol steady, make sight alignment as natural as possible, reduce recoil displacement when firing and place the trigger finder in a position which supports proper trigger pull. We will start with a discussion on the overall placement of the hand and build up from this base. The first point on hand placement is to get as high up the grip as possible. 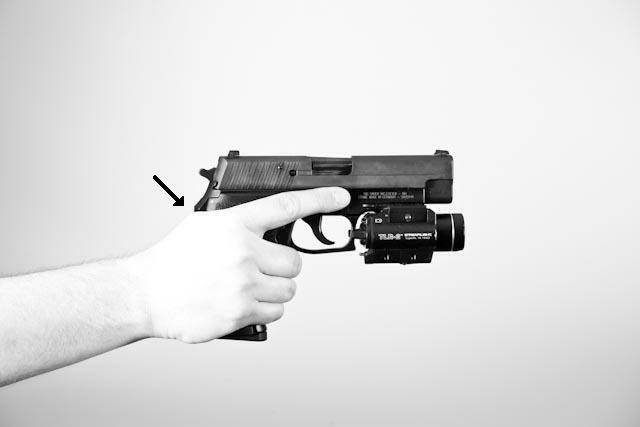 As we can see from (Fig 3) the recoil of the pistol happens along the direction of slide travel, which is higher than the grip. As we are unable to get directly behind the slide itself, getting as high as possible will help to reduce the upward rotation of the pistol and keep recoil more manageable. (Fig 4) shows an incorrect low grip. Notice how there is space between the web of the hand and the tang of the pistol. (Fig 5) shows a correct grip with the web of the hand as high as possible. There are a few instances where one may choose to hold lower (i.e. to reduce the length of double action pull on a Sig 226) however, a high grip which is tight under the back of the pistol is the way to go. Every time you pick up your pistol, or draw from your holster, grab high on the grip and push the web of your hand firmly up into the backstrap. The Second point on hand placement is how the hand aligns when it grips the pistol. In gripping the pistol, most people will have the tendency to ‘over grip’ and wrap their hand too far around the front of the pistol. 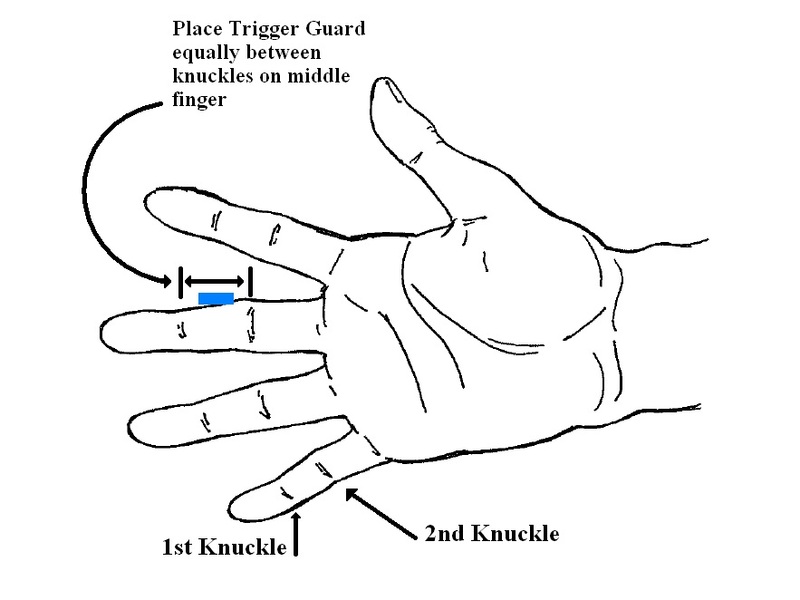 To determine if we are over gripping the pistol, one needs to look at the space on the middle finger between the first and second knuckle (Fig 6) and orient this space correctly. (NOTE: Knuckles are commonly referred to by number, but there is no set way to do so. For the purpose of these articles I will be numbering from the finger tip back, so the Distal Interphalangeal joint is #1, the Proximal Interphalangeal joint is #2 and the metacarpo-phalangeal joint is #3). 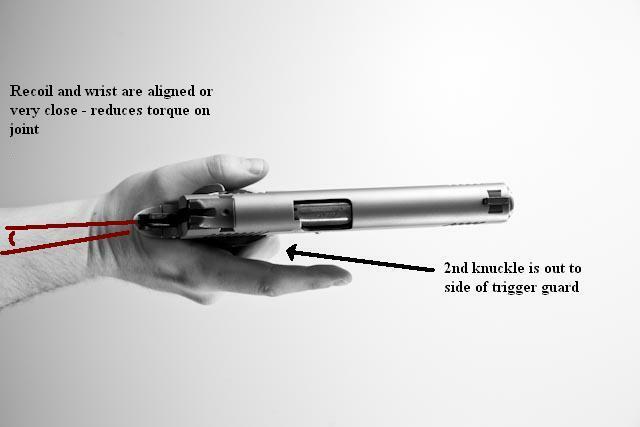 With over grip, the second knuckle will be in line with the trigger guard and be pointing down the line of the barrel, which sets the direction of recoil off center to the wrist. This can create problems with natural pointing and result in misses when firing quickly and furthermore an incorrect grip can lead to pressure points and pain when firing. 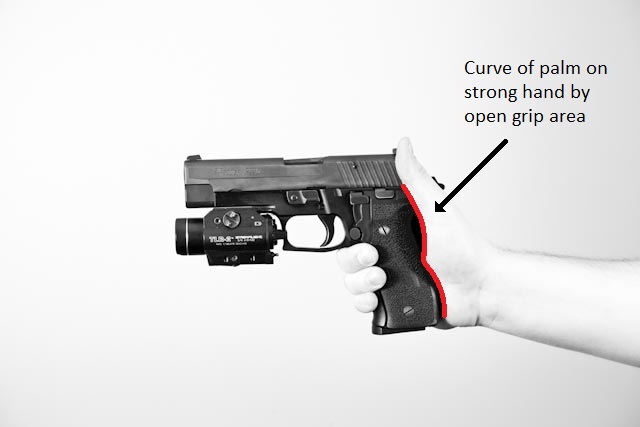 (Fig 7) shows the very common incorrect ‘over grip’ on a pistol. 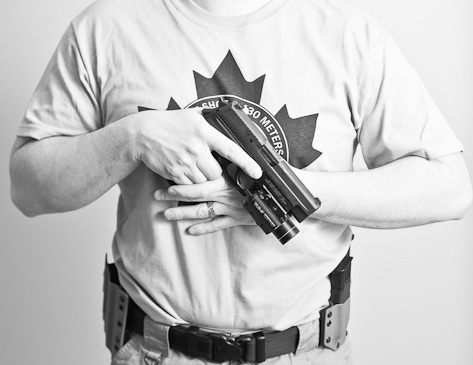 To obtain a correct grip we must come back around the pistol so that it aligns with our wrist and forearm. The easiest way to do this is to ensure that the 1st and 2nd knuckle on your middle finger are on either side of the trigger guard, which will bring your thumb further back and around the pistol grip. 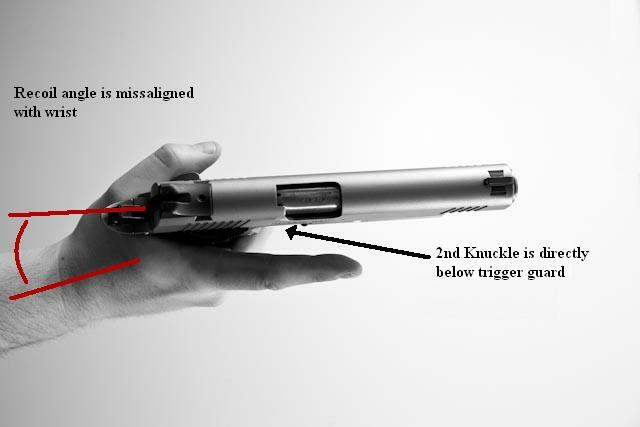 (Fig 8) shows correct grip with 2nd knuckle visible to the right of the trigger guard. When you first do this it may feel awkward, or at the least a little odd but with time it will become second nature. As above, every time you pick up your pistol or draw from your holster, check that your knuckles align with the trigger guard properly and adjust if necessary. Personally, when I started shooting I held my pistols with significant over grip due to my background with sword related martial arts and I even sold my XD9 because of the discomfort on my thumb before I saw the light and came back from the dark side. This thumb or middle finger discomfort is so common in square edged pistols it is often referred to a ‘Glock Knuckle’ due to the predominance seen in those incorrectly holding the square edged Glocks. It took me a decent amount of time to unlearn this nasty habit! Last but not least, the strong hand grips the front and back of the handle. Don’t worry about maintaining contact with or gripping the sides. Few people realize just how important the ‘weak’ hand is to proper shooting form. They simply throw it in there as an after-thought or use it to replicate the coolest pistol hold they saw in the last action movie. Just a quick bit of advice – Using the movies to learn how to shoot is like using the fringe adult film industry to learn how to enjoy private time with your partner. Tom Berengers Super Ninja front kick crouched shooting position will do no more for your accuracy than including a midget goat will likely help your partner enjoy their experience. (I say ‘likely’ because somewhere someone is reading this and thinking their midget goat does just fine) This pre-determined idea of shooting is another of the reasons that women are usually easier to teach than men -They haven’t seen the art of firearms completely and repeatedly butchered in their last 20 ‘boy meets girl and you’ll never see this coming but they actually fall in love’ movies. Regardless – the weak hand position is very important. Canting on the off hand. That’s not CAN’T as in “I can’t believe someone somewhere likes midget goats!’, it’s CANT as in ‘angle’. The off hand should be angled so that the Metacarpophalangeal joints (Them big knuckles where your fingers meets your hand) are at a 45 degree angle to the ground. 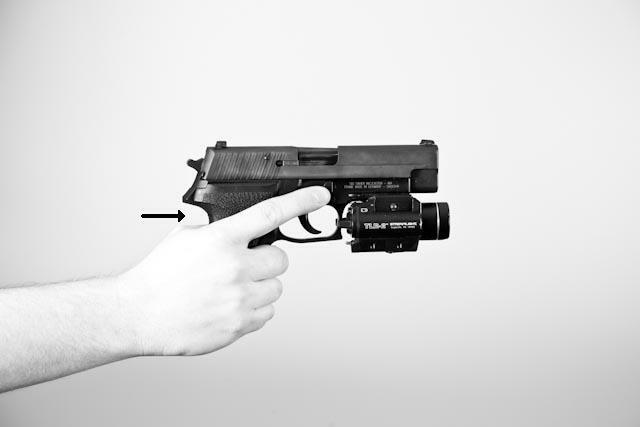 (Fig 9) shows the hand straight forward, while (Fig 10) shows the hand at the correct angle with the thumb directed along the axis of the barrel. 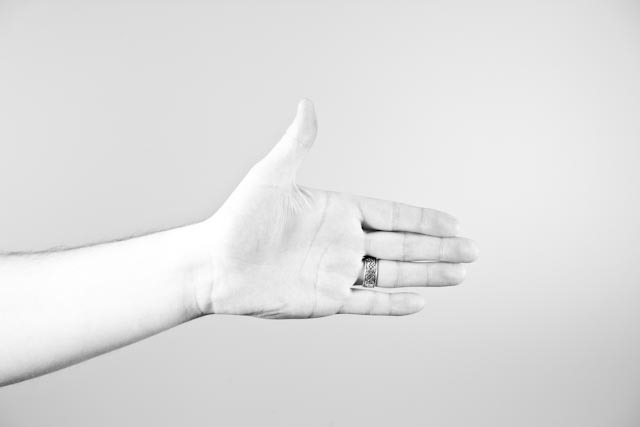 (Fig 11) and (Fig 12) shows acquiring a 2 handed grip and how one can use the fingers on their strong hand to orient and provide groves for the off hand. 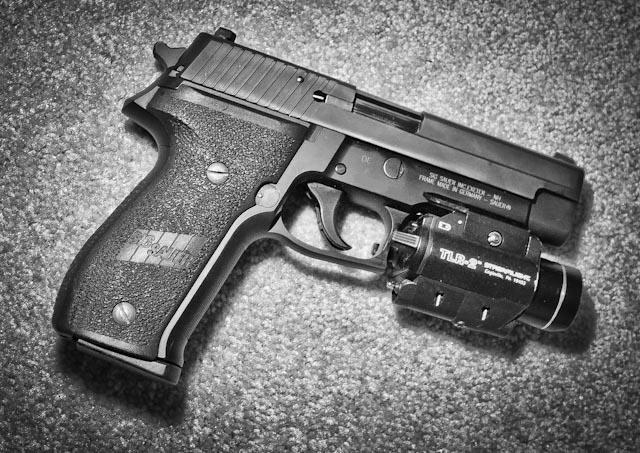 This grip allows good, strong contact on the primary hand and the pistol itself, and assists greatly with minimizing vertical recoil displacement. To achieve the downward angle of the hand at extension, the off arm needs to be quite straight, which we will address later. Placement of the hand. Chances are, regardless of your age, gender or religious orientation, you have put together a puzzle (or at least tried to do so) at some point in your life. Placing the left hand correctly is as easy as that. Round peg – round hole, square peg – square hole, dodecahedron peg – you are on your own. 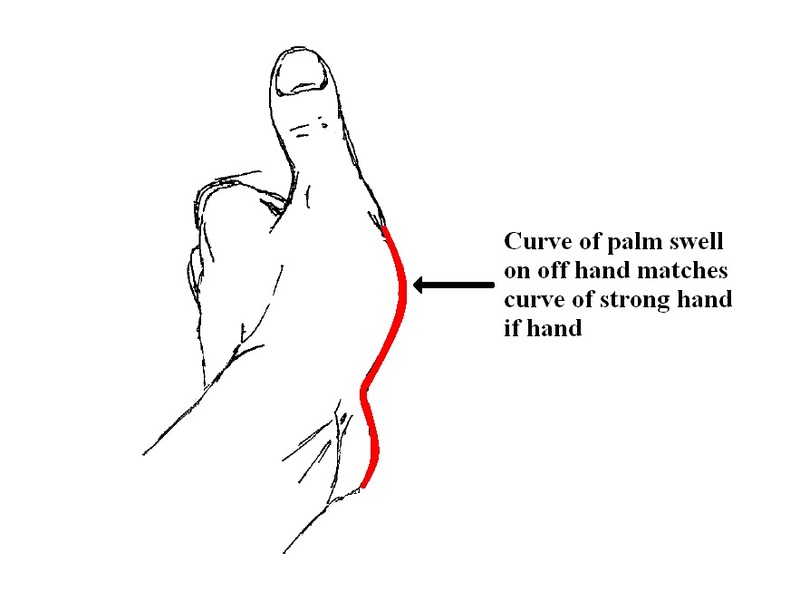 The following three pictures (Fig 13), (Fig 14) and (Fig 15) show how the palms of both the right and left hands fit together to get maximum purchase on the off hand side of the grip. By filling the gap or ‘hole’ left by the strong hand we are also removing another path of least resistance from the recoil force. In fact, without providing counterforce on this portion of the grip, one will see a tendency for the pistol to recoil up (as the barrel is above the grip) and to the side opposite the strong hand grip where the ‘hole’ is found. Recoil Management and placement height of the weak hand. Recoil can certainly add to the fun of shooting – or the pain if you are popping off .454 Casull or .500 S&W, but it also adds to the challenge. A detailed analysis of recoil would include Moments, Inertia, Force Vectors etc. but for those of you who are not engineers and don’t think of Scotty on the Enterprise as a hero of your child hood, I’ll try to keep this simple enough to develop and understand but not put anyone to sleep. When a force is applied to an object, but the force is not in line with the center of gravity of that same object, a rotational movement is imparted. 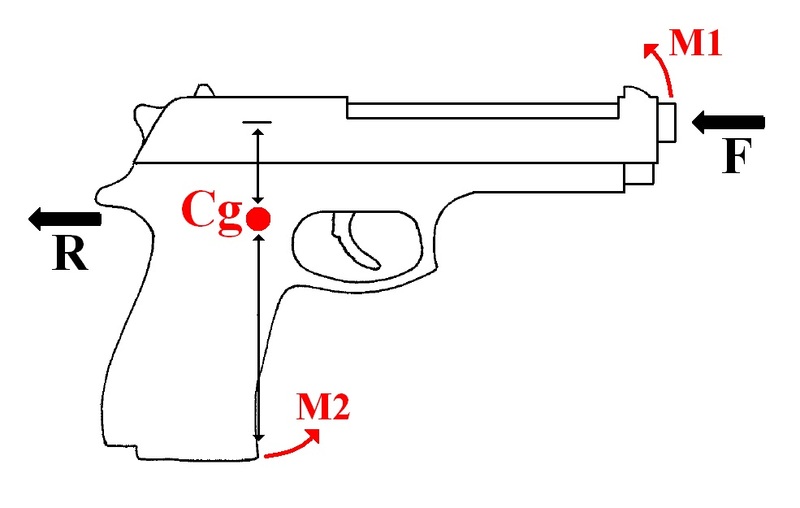 (Fig 16) shows the outline of a pistol with its center of gravity (CG) marked. Any force in line with the CG would simply move the entire pistol in the direction applied. 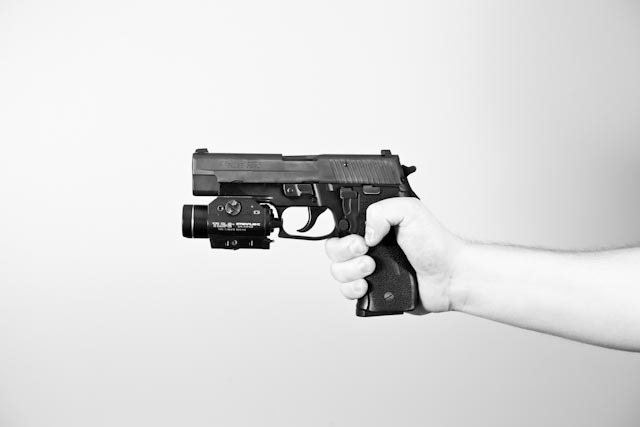 Force F (in this case, the recoil force from firing a round) is not in line with the CG, and will cause a both rotational reaction (called a Moment) in the pistol as well as a component force R moving the pistol backwards. 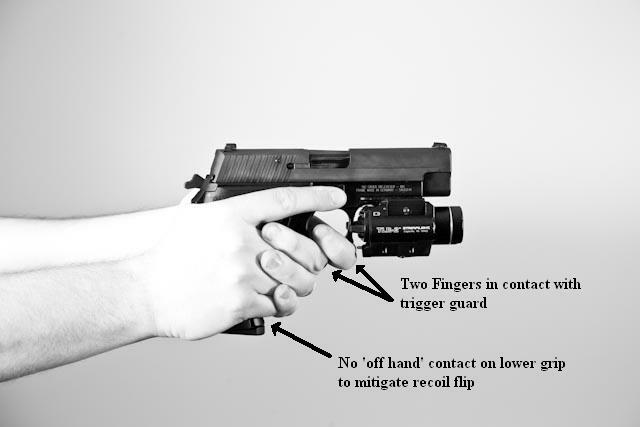 As the front of the pistol begins to rotate ‘up’ with Moment 1 (M1), the bottom of the pistol, or the front bottom of the grip, will be moving forward relative to the CG (M2). By angling our off hand, we have increased the strength and leverage of our pinky finger which we can now use to counteract M2 – thereby reducing M1 and the front sight’s journey to the sky. To do this, the pinky is brought into contact with the bottom of the grip where the magazine is found so that it will impede any forward movement. 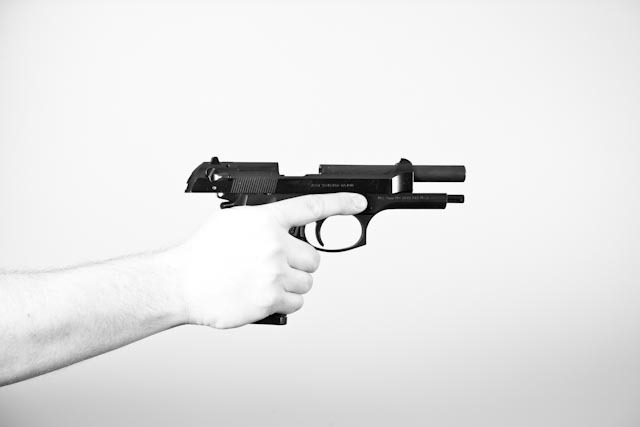 Some shooters will tend to sit the fingers on the off hand high and will have 2 fingers sandwiched under and in contact with the trigger guard (Fig 17). I tend to sit my off hand lower (Fig 18), with only one finger touching the trigger guard to get the pinky on the grip to counteract the rotational component of the recoil. In theory, a higher grip *may* make it easier to reduce recoil by increasing available grip strength, however I find the lower grip to be more successful. In the end whichever keeps you warm at night is good enough for me. What do I do with this extra thumb? Most new shooters find that they feel as if they have 3 thumbs, with nowhere to put them. 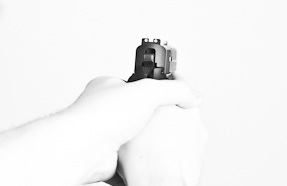 The answer is simple – the weak hand thumb points to the target and runs along the side of the pistol while the strong hand thumb rests on top of this (Fig 19). Either way, DO NOT EVER wrap your week hand thumb over your strong hand (Fig 20) or you will find out that your pistol is like a snake and it can BITE you if you mistreat it. (Fig 20) Pain teaches us a lesson very quickly. Wrapping the off hand thumb over the strong hand (in the way of the slide) is a quick way of being taught not to do this. Last but not least, the off hand grips the sides of the pistol as well as the strong hand like a closing clam shell. Go ahead and grip the snot out of it if you wish, as this will help keep the pistol snug and comfortable to handle while firing. Many people say that a 60/40 or 60% grip from the off hand and 40% grip from the strong hand is the ideal mix and this is what I go for when shooting accurately. When shooting under stress I go 100/100 for fast follow ups and as it is easier under stress than trying to feel your grip and modulate to perfection. Feel free to experiment with what you find most comfortable. 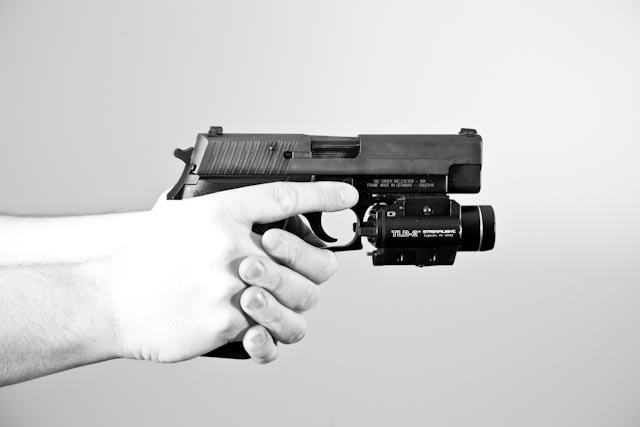 When shooting with only one hand, the strong hand grip address above remains the correct choice. 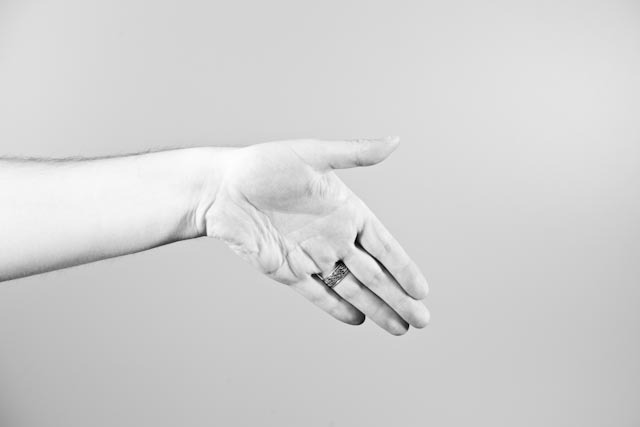 The positioning of the palm, fingers and web of the hand remain constant, with only the thumb given a few options. One can either maintain the thumb straight along the side of the grip (Fig 21) for natural pointing, or one can bend the thumb down to provide a little more support on the off side (Fig 22). Revolver shooters will often adopt a thumb down position as they are used to this whereas those used to predominantly shooting semi autos will be more accustomed to straitening the thumb. Being accustomed to double handed grips for auto pistols I tend to prefer the pointed thumb grip due to familiarity, but I am still working on both before I decide what I’ll stick with. The only other difference is that one should angle the pistol to about a 45deg (Fig 23). 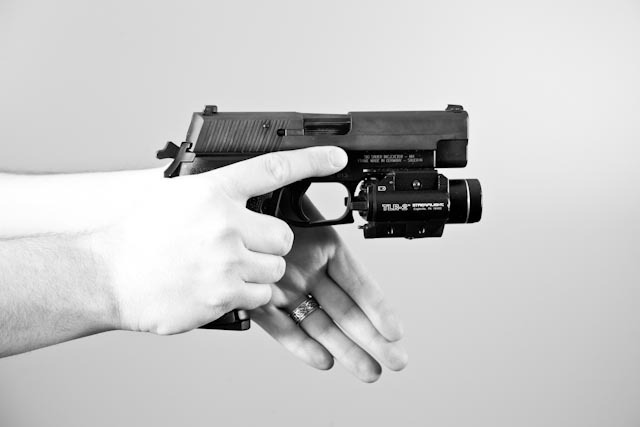 Don’t confuse this with the ever popular ‘pop a cap’ gangster position of having the pistol sideways, but instead this is to obtain a more comfortable natural arm position while still allowing good alignment of the sights with the target. Originally shooters were taught to blade themselves and provide as small a profile as possible to their adversaries. This led to a 45deg angled torso and a bent left arm and straight right arm (for RH shooters) (Fig 24), which is often known as a ‘Weaver’ stance after the gentleman who first popularized it. One of the advantages of this is the countering forces of one arm pulling and one pushing against one another. Over time positions have evolved to the current model where most competitive shooters or combat shooters take a stance which squares their chest and shoulders to the target (Fig 25). This provides good support along both arms for recoil, and a steady body framework for shooting. To accomplish this, stand with your shoulders parallel to the target facing forwards. Obtain the correct grip and push the pistol out to the target. In reality you will not make a perfect triangle with your arms, but a triangle with its apex (the pistol) centered across from the dominant eye (Fig 26). Extend your arms but do not lock your elbows as you want to have some small bend to absorb recoil. At extension it is likely that you will have a very straight off hand arm and a slightly bent strong hand arm. This is simply because the off hand arm must travel further and be straighter to point the thumb towards the target and get ahead of the strong hand palm. In regards to your back, you should be leaning towards the target, never away from it. Many people will subconsciously try to get away from the loud flashy thing in their hand and end up leaning back as far as they can – which incidentally destroys your balance, robs you of recoil absorption, and provides a good way to fall over. How you hold your feet is not nearly as important as the upper body and can vary from person to person considerably. The two things you always want to achieve with your stance are balance and mobility. regardless if you lead with either leg (Fig 27) or table your legs to the target (Fig 28), your feet should always be shoulder width apart, with your weight on the balls of your feet. An easy way to find correct distance is to jump in the air. Where your feet land is a natural place of balance – provided you are not Mr. Poor Coordination himself. People seldom consider the grip of the pistol in regards to safety, but as we are trying to create habitual methods in both hand and body position, we need to consider how we hold the pistol in regards to barrel direction. This is especially true when we are at rest. It is not uncommon to see someone lower their pistol safely and then relax while it is pointed at the ground, which is not a problem until ‘pointed at the ground’ becomes ‘pointed at their foot’. To minimize this I prefer to adopt a method of holding the pistol when at rest (it is not either on a shooting table or holstered) that keeps the muzzle direction under control and will place the firearm where it is unlikely to be bumped into, swung or forgotten about. This position (Fig 29) is called ‘Sul’ which translates to ‘South’. To obtain Sul, come off the grip with the support hand and place it flat on the center chest all while keeping both thumbs in contact so that the hands are indexed and it is easy to re-establish proper grip. It is likely you will need to relax the strong hand and slide down the back of the pistol grip a little to ensure that the barrel will be pointed directly downward. 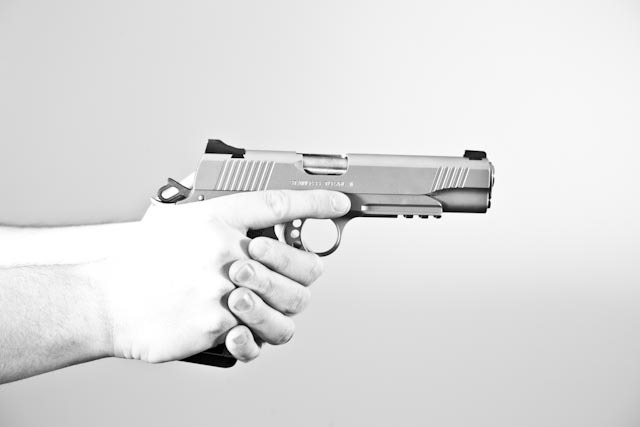 The disadvantage of this hold is that it causes torque on the wrist and the discomfort can lead to the habit of relaxing the wrist by pointing the pistol off to the side somewhat (Fig 30). This is dangerous if standing in close proximity to others as on a firing line as you can seep the legs or feet of those around you. If you are going to use Sul, insure that you concentrate on keeping the muzzle down and do not let it creep off to the side. (Fig 30) 'Sul' Position with wrist relaxed and barrel pointed off to the side. Your shooting pals may not appreciate this one! 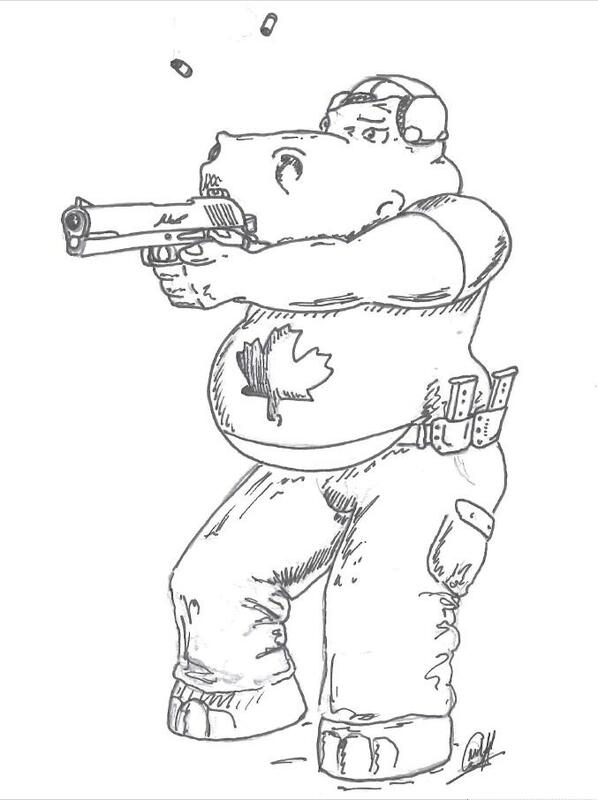 HIPPY THE HIPPO says – Stop shooting when you are tired. You will develop bad and sloppy habits and NO ONE wants the be the guy who shot themselves because they were snoozy. All Photographs by Bob McKerrell ( www.bobmckerrell.com) – Thanks Bob! All Drawings, Diagrams and Words by Mike C.
Very excellent article. I’ve shown this write up to many people and it’s helped us all improve. Thanks for putting something like this out there free of charge! Thank you so much for this awesomely informative (and entertaining) post! I’ve been shooting regularly for over 3yrs now and have even dabbled in some pistol combat leagues- for “fun”- as well. But I’m one of the “lucky” ones, as you described and am cross eye dominant (LH shooter). I cannot close my left eye independently of my right to save my dang life. Never have and never will. Trust me, I’ve tried EVERYTHING! So I grew tired of fighting it and now I just embrace my “luck” and work towards perfecting it, while still practicing with my weak (but stronger) right hand. Any good shooter should be able to use their weak hand as well as their strong hand equally well, right??? So anyway, thank you for this. I think it will help me tremendously with trigger finger placement. Did I mention I have long fingers for a woman lol? Makes gripping smaller pistols a b*tch…to say the least. So naturally the 2nd knuckle of my middle finger wants to over grip the trigger guard…. This is going to take a lot of practice to fix…. But thank you, this is the most thorough post I’ve read yet! Hey DeLynne, Thanks for the positive comments! Interestingly, females have a higher percentage chance of being cross eye dominant so you are certainly not alone! It can become a real spanner in the works when you start bringing rifles and carbines into the mix where one has to shoulder the firearm to one side or the other. In that case I’ve seen success with a preference to strong eye or strong hand so I work with my students through both and ask them to pick whichever they prefer. Either way its going to feel a little awkward for a while. Fortunately for lefties (women especially) they have a better chance of being ambidextrous which can help with strong / off hand training. I sincerely hope you were blessed with that bit of luck! In the end it sounds like you are on the right track with your dedicated training while still keeping things fun, so keep at it! The more competitive, combative and tactical fancy pants things I do with firearms the more it always comes back to the fundamentals. As always let me know if you have any questions I can help with. Great article. I’d been looking high and low for a good explanation of HOW to pull the trigger straight back as opposed to just telling me to do it. Your explanation of articulation of the knuckle was just what I needed, along with many of your other tips. A lot of great info for a relatively short article. Bravo.